First post-baby project done and dusted! (A month ago and just getting to writing it up now, but never mind). 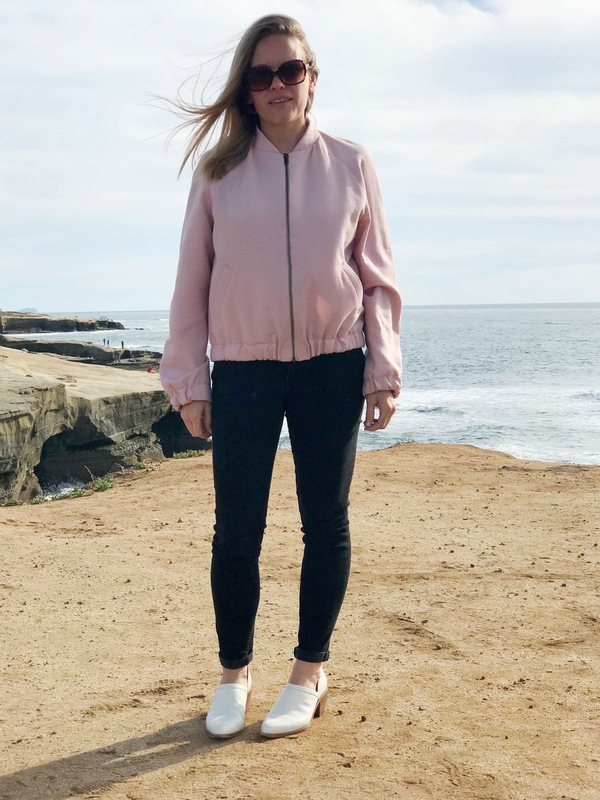 This little jacket is a pink wool bomber which I would have laughed at you for telling me I would make it a year ago, but here we are. 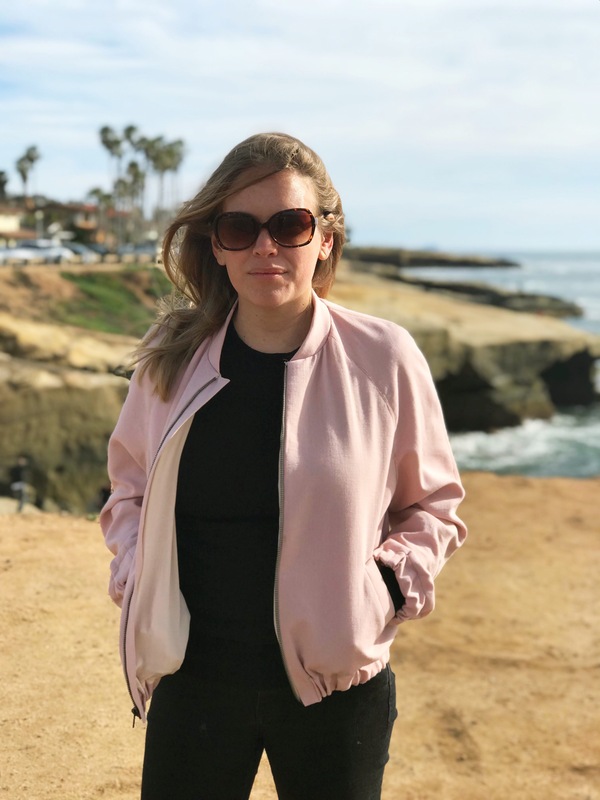 I saw this jacket on Cuyana and weirdly loved it so much. I had this rosey pink wool crepe living in my stash. It’s previously been made into a shift dress that I no longer wear because those were early sewing days and I hadn’t yet figured out my style or decent pattern selection. Any who, the rest of the yardage has been sitting around for a few years because who needs four yards of dusty rose crepe?! (Dear past sewing self: Fabric Mart sales are not always the answer). 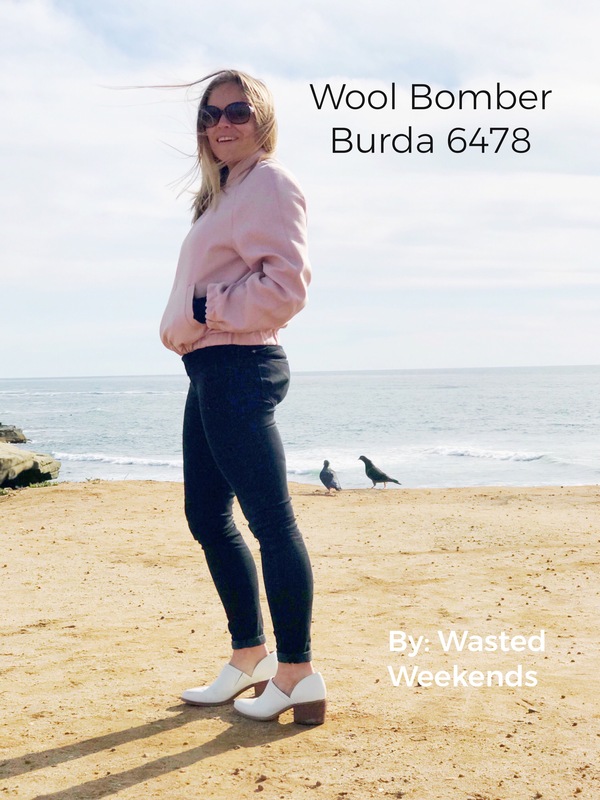 I hunted around for a good bomber jacket pattern, because see above about never thinking I would make one and came back with this from Burda. I also really liked this McCall’s/Beaute J’adore collabo — and especially that it had a conventional shoulder seam rather than raglan treatment — but I’m generally not on the super-statement sleeve train and I didn’t want to figure out how to fold out all those pleats so Burda it was. To that end: I didn’t adjust anything here except shortening the sleeves 1/2″ and taking it in 1/2″ at the side and underarm seams to reduce the volume a bit. The pattern is super easy and putting it together went by quickly. Two weird things: unless I’m a complete dunce and really cocked up the sewing, you need 1-inch elastic for the waist and sleeve hems, not 1.5” as recommended with the pattern. And I’d recommend lengthening the lining pieces. The lining was doing that annoying thing where it tugs the hem up inside of the garment. I used scant seam allowances between the jacket and lining to relax that problem a bit, but would generally recommend just adding a bit of length. Come to think of it, this might resolve the elastic width problem, but I can’t be sure. I didn’t like the zippered pockets, so I used single welts process included in this book instead and am happy with that decision. But I was itchy to sew something and just couldn’t be bothered for this version. I love the jacket and I wear it all the time now. With the color and the choice of wool, it works in both casual and slightly less casual settings. It doesn’t really work over this one-shoulder dress at a wedding, but Cali was unexpectedly cold and so what are you going to do. I wish I had a pic of our first time dressed up post baby, but we were too frazzled to remember to take photos! Very cute – and I can’t believe you have time to sew! Impressed. Isn’t it funny how things change post bubs? But, it still gets results, and bar the wee niggle about sleeves and neckline pulling, looks great! I’m so surprised you have a fear of anything sewing-related!! Looks great! It’s such a conundrum- When one has limited post baby sewing time so can’t be bothered tracing/toileing/ but oh the devastation if it doesn’t work out! 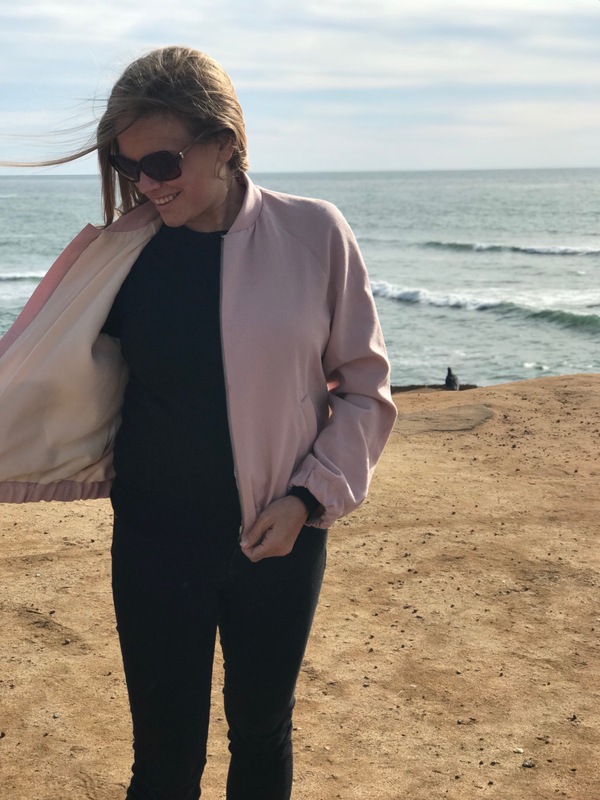 I love a pink jacket and I’m totally into bombers. I like it! And, yay for post baby sewing time. Hi there, did you have any trouble getting the collar to stretch to fit the neckline when sewing that seam? I’m trying this pattern at the moment and my collar absolutely won’t stretch enough! Hmm. I do remember something not being right, now that you mention it, but I also remember that it was okay once I unpicked and thought about it a different way. I’m sorry I can’t remember now what the exact problem was. At the time I blamed it on new baby brain, but maybe there’s a labeling issue with the pattern. I try to sew myself, but my work does not look as good as yours. Good job. I admire! Thanks for the inspiration and waiting for more such works.